My header photo shows the Abbaye de Notre-Dame de l'Annonciation at Le Barroux in France. 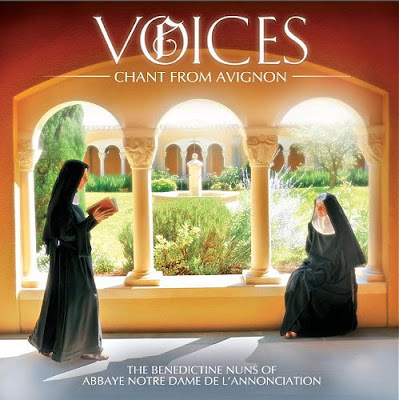 The quote below it comes from Voices - Chant from Avignon, the official website of the new CD from the nuns of the Abbey. This album was released on Nov. 8 and Decca is hoping it will chart over the Christmas period. To achieve this the label are running TV commercials in the UK, which is very unusual for a classical release. The official Chant from Avignon website provides a great introduction to the album. But there are also some aspects of the nuns "secret world of peace and calm" not mentioned there that deserve to be shared. The Abbaye de Notre-Dame de l'Annonciation at Le Barroux, which was founded in 1979, is a sister house of the community of monks at the nearby Abbaye Sainte-Madeleine. This was formed in 1970 by Dom Gérard Calvet, scion of the wealthy Calvet Bordeaux wine dynasty, as a reaction against the cautiously liberalising reforms of the Second Vatican Council. 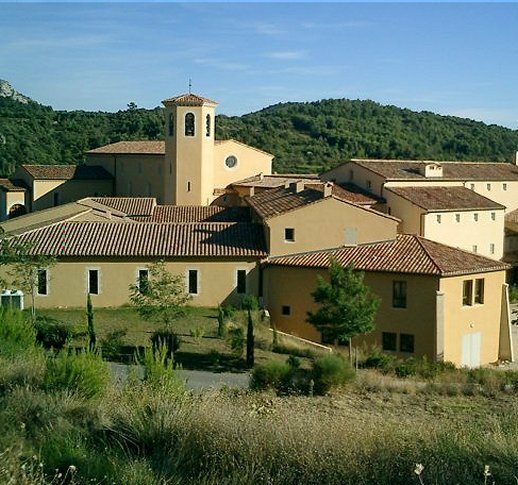 For almost two decades the monastery at Le Barroux was aligned with the far right Catholic traditionalists Archbishop Marcel Lefebvre and his Society of St. Pius X. A degree of notoriety is attached to the Society of St. Pius X, Archbishop Lefebvre and other elements within the traditionalist Catholic movement. As described here previously, in 1994 France's most notorious war criminal, Paul Touvier, was defended by a traditionalist Catholic lawyer and a priest from the Society of Saint Pius X founded by Lefebvre sat beside Touvier throughout his trial and acted as his spiritual advisor. Paul Touvier had been on the run in France for a total of 35 years and was sheltered during that period in a number of traditionalist Catholic monasteries, although there is no evidence that he was given refuge at Le Barroux. At his trial Touvier was found guilty of crimes against humanity and was sentenced to life imprisonment. As well as being involved in the massacre of seven Jews at Rillieux-la-Pape in 1944, Touvier was linked to the murder of Victor Basch and his wife Ilona. Basch was the former president of the League of Human Rights which in the 1890s had led the defence of Alfred Dreyfus, the Jewish French army captain falsely accused of treason. French police had arrested Paul Touvier in May 1989 at the priory of Saint-Joseph de Nice run by followers of Archbishop Lefebvre. Just one year earlier the monastic community at Le Barroux had split from Lefebvre over his decisions to consecrate bishops without Vatican approval. This split brought reconciliation with the Vatican and today Pope Benedict XVI is considered to be an ally of the two monasteries at Le Barroux. There are many who will say none of this is relevant to a CD released in 2010. But I hold a different view. Paul Touvier's high profile trial took place just sixteen years ago, which is within the lifetime of the youngest nuns at Notre-Dame de l'Annonciation. Yes, the monastic community there had distanced itself from Archbishop Lefebvre six years previously. But today the community at Le Barroux remains firmly traditionalist Catholic and holds views on topics such as homosexuality and religious inclusivity that are at variance with those commonly accepted elsewhere. In small villages in France where there are traditionalist Catholic monasteries the block voting of the monastics can be an important factor in elections. During the second round of the 2010 regional elections in the commune of Le Barroux far right National Front party leader Jean Marie Le Pen came a close third with 30% of the 339 votes. This video shows another National Front politician Bruno Gollnisch speaking in Le Barroux village in October 2010 in support of Le Pen. Gollnisch, who is part of the Catholic faction within the National Front, has previously been tried and acquitted on appeal for contesting the existence of crimes against humanity and he publicly supports the French Government's move to deport the Roma. By signing a deal with Decca and by becoming internet and Facebook properties the nuns of Notre-Dame de l'Annonciation at Le Barroux have held themselves up to public scrutiny. As part of this, their music making needs to be put into a wider context than is offered by Decca's carefully orchestrated PR campaign and the resulting fawning mainstream media coverage. I am not suggesting that the nuns' glorious CD should be boycotted because of their traditionalist Catholic views. In fact, I hope many people buy the disc and go on to appreciate both the riches of sacred music and the infinite possibilities of the spiritual realm. But On An Overgrown Path has always followed Pablo Casals' credo that a musician is also a person. By choosing to become media properties the nuns at the Abbaye de Notre-Dame de l'Annonciation are now people as well as contemplatives. Which is why I have written this article. * An update on this story here. I am so happy with the fact that these nuns used to be levebvrists and are now entirely in communion with Rome!